Social Interaction is an important part of our everyday lives that we take for granted. We interact with others either at the office, grocery store, out for a walk, at the gym, driving in the car or even on the phone or Internet. Just by chatting or leaving a comment on a blog is communication. God has called us to interact with people and witness our love for Him by our actions and attitudes. So how does this relate to fitness? When we workout it is much more fun with a partner, with social interaction. I find I laugh a lot more and get a better core workout at the same time! Grab a spouse or friend, or even one of your children, for some of these fun exercises that will torch some stubborn fat. You do not have to be the same fitness level for these! * Remember before you exercise, even if it’s a little bit, warm up your body for a few moments and then stretch your major muscles holding for about 15 with each stretch. Every 20 minutes of sweating exercise you should drink 3 ounces of water. Keep hydrated. One Legged Ball Toss – Stand on one leg and toss the ball back and forth. Make it harder by not touching your raised toes to the floor the whole time. Switch after 12 tosses on one leg. You can use any type of ball for this exercise, but a weighted medicine ball will help burn a little more calories than a basketball. You can also make it harder for your partner by throwing it from a farther distance or making it challenging to catch! Patty Cakes: Keep core tight and in a plank position switch as fast as you can giving your partner a high five. Tap opposite hands. If a full plank is too hard, then take it to your knees. Remember to keep your body in a plank, hips low, core tight the whole time. Shoulder Taps: Same as Patty Cakes, just tap the shoulder instead of giving a high five. Partner Situp Toss: Feet can touch or lace them together for leverage. Each time the ball is passed to the other partner, both go down for a sit up. On the way up, toss the ball and repeat. 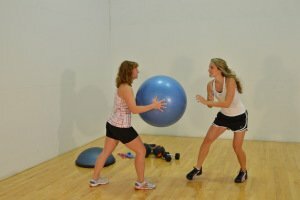 Partner Oblique Twists: Take a medicine ball, or any sports ball and sit side by side with your partner. 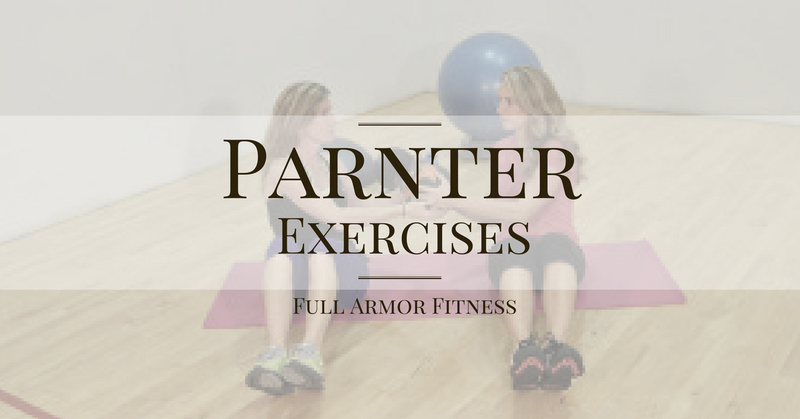 As one partner goes to twist away from the partner, the other partner goes down for a sit up. Both come together and switch the ball off. Whoever has the ball performs an oblique twist away from their partner. Whoever does not have the ball performs a situp. Plank Hop Overs: One partner positions in a plank as the other partner hops over back and forth. Be careful not to jump on the legs of the planking partner! The higher your hop the more calories you burn. 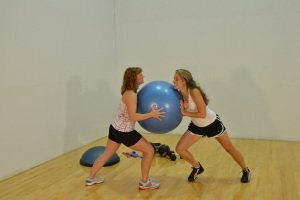 Ball Pushers: One partner stands with a large ball ready to push back the partner coming at them. Push back each other using shoulders – this is a super fun one with cardio benefits too! Try to push your partner back a few feet before switching turns. Have fun with your partner and make sure you laugh a lot! I quite like reaԁіng an articlе that will mаkе mеn and women think. Also, thank you fοr allowіng mе tо comment!